Upper Darby's J.D. McGillicuddy's plays host to a failed attempt at the lift scene from "Dirty Dancing." If you want to imitate a movie, maybe it's best to stick to the dialogue. 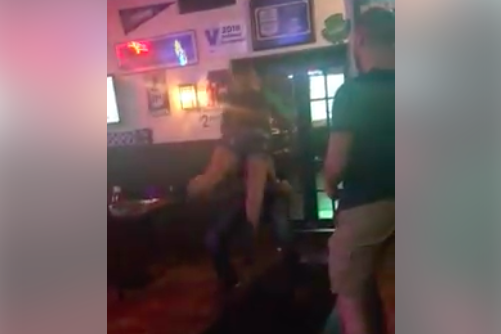 That's what one viral video from an Upper Darby, Delaware County, bar proves in nearly disastrous fashion. Kristina Dumont was having "a Sunday funday get together" at J.D. McGillicuddy’s, 8921 West Chester Pike, after some friends had gotten married the previous day. Dumont's sister put on "(I've Had) The Time of My Life," the Bill Medley and Jennifer Warnes duet that plays at the end of the 1987 classic "Dirty Dancing." In the movie's finale, Jennifer Gray and Patrick Swayze finally nail the challenging lift in their dance routine, which Baby had been having a hard time learning. As Dumont explained in a blurb for Viralhog, her sister attempts to do the lift every time she hears the song. Most of the time, she is not successful, and as you can see here, she and her partner failed again, crashing through the bar's swinging doors into "an elderly get together for 'an Irish night out.'" Ladies, don't drink and do the lift. Your man may be everything to you, but he isn't Patrick Swayze.